It's getting cold people, time to bundle up. Take everything you own and just wear it. Pile on the piles and walk around looking homeless...don't think the homeless wear Nanette Lepore scarfs or topshop but you get my point right? As usual been spending most of my time in Soho meeting up with friends, eating at Park and getting coffee at my favorite spot. I've been in major layer mode...sorta going back to my roots on this one, in terms of layering. Wore a stripped dress under a sweater under a huge vintage jacket that keeps me warm beyond believe! I have to tell you guys It's been a really hectic past two weeks. I'm moving to Brooklyn in February and moving is..exciting but scary! I have so much stuff to pack it's making my head hurt but It's going to be all so worth it in the end. Congrats on moving! Such an exciting thing! Why the change in scenery? Don't you like Manhattan? I love your fur + yes we are all running around in homeless style!! Love it! Beautiful outfit ! Love your scarf ! niiiiiice. Love this clochard way of dressing!!!!! Wow Adore this gypsy outfit full of colours and layers! Awesome! oooh I'd love a close up shot of that ring! Looks MONSTEROUS! love it! Such great layers!! Just friggin love! LOVE the mix of textures here, that scarf and coat are a match made in heaven. You look beautiful. Hope all goes well with your move to Brooklyn. Waaa...this is just gorgeous! Love all the colors and prints! 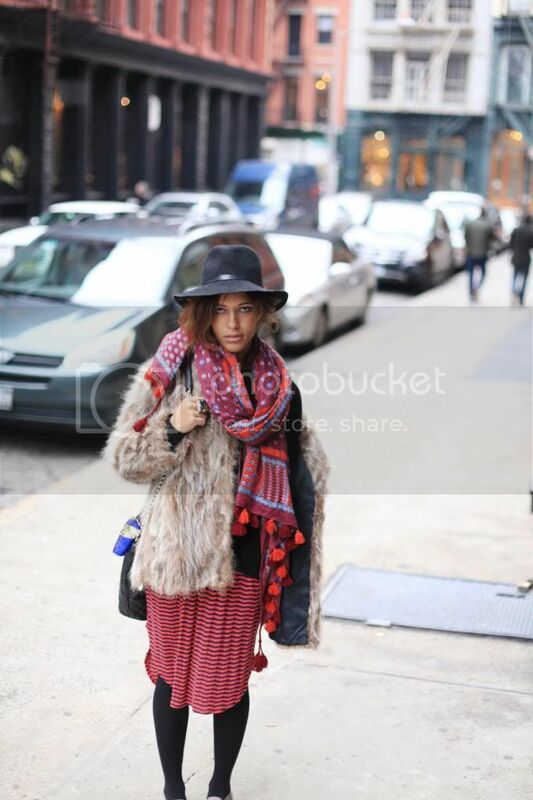 Je t'adore en gypsy woman! the furry coat looks so warm, yep we are freezing in my city as well. Great coat. you should try idle super market game to get more shopping experience.